Circulation policies pull together user, library, and item data to determine how library materials circulate, such as: which patrons, from what libraries can borrow what types of materials, for how long, and with what overdue fines. Individual elements of the circulation policies are configured using specific interfaces, and should be configured prior to setting up the circulation policies. There are a few data elements which must be considered when setting up your circulation policies. Several fields set via the copy editor are commonly used to affect the circulation of an item. Circulation modifier - Circulation modifiers are fields used to control circulation policies on specific groups of items. They can be added to copies during the cataloging process. New circulation modifiers can be created in the staff client by navigating to Admin > Server Administration > Circulation Modifiers. Circulate? flag - The circulate? flag in the copy editor can be set to False to disallow an item from circulating. Reference? flag - The reference? flag in the copy editor can also be used as a data element in circulation policies. 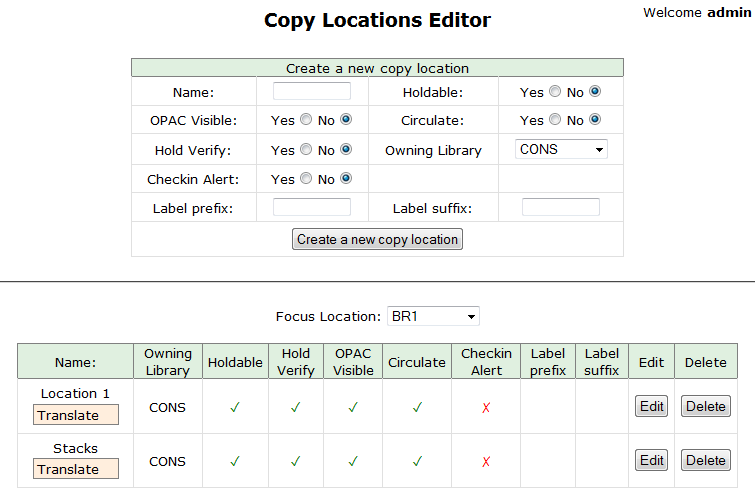 To get to the Copy Locations Editor, navigate to Admin > Local Administration > Copy Locations Editor. Set Hold Verify to "Yes" if when a copy checks in you want to always ask for staff confirmation before capturing a hold. Set Checkin Alert to "Yes" to allow routing alerts to display when copies are checked in. Set Holdable to "No" to prevent copies in an entire copy location from being placed on hold. Set Circulate to "No" to disallow circulating copies in an entire copy location. If you delete a copy location, it will be removed from display in the staff client and the catalog, but it will remain in the database. This allows you to treat a copy location as deleted without losing statistical information for circulations related to that copy location. Copy locations can also be used as a data element in circulation policies. The user permission group is also commonly used as a data element in circulation policies. Other user data that can be used for circulation policies include the juvenile flag in the user record.